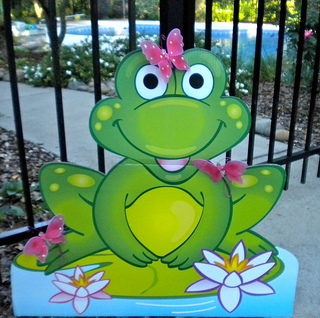 Bullfrogs and Butterflies was the pool party theme idea for our granddaughter who was turning 7. She wanted a butterfly themed party but she also wanted to invite some boys. Her idea was to have a butterfly party that also included lots of frogs. 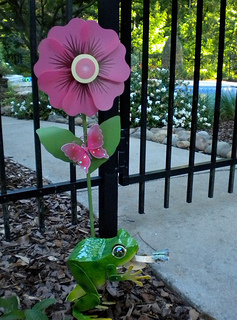 Starting at the pool gate a sweet butterfly sits on top of flower wind spinner with a friendly frog ready to make a leap. I always like to have something floating in the pool as part of the pool party decorations. 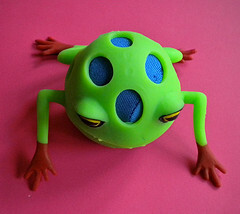 Frog shaped beach balls do just the trick. Use them for pool party games and then as take home favors. 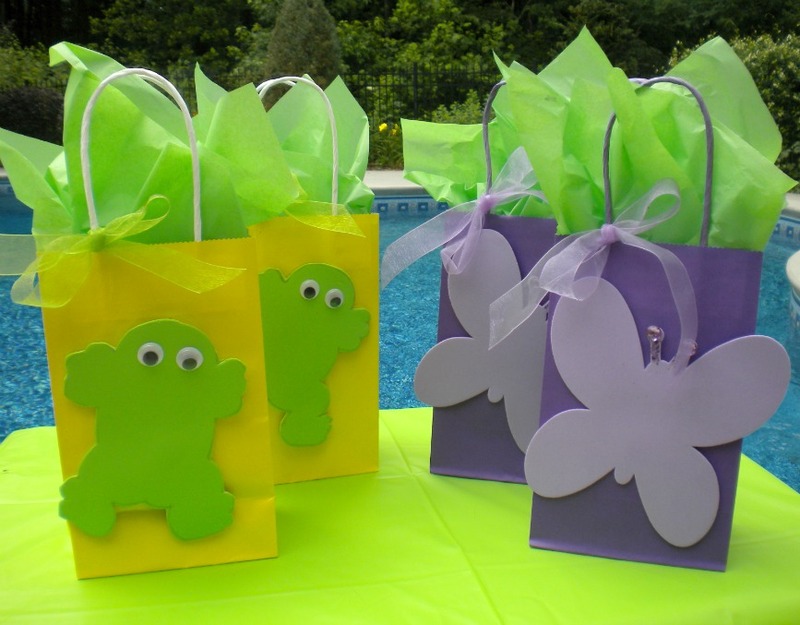 Plain colored party bags were embellished with simple frog and butterfly foam shapes. Lime green tissue paper adds a pop of color. Party favors included frog squirt guns, green slime and frog stickers for the boys and butterfly necklaces, butterfly tattoos and butterfly rings for the girls. 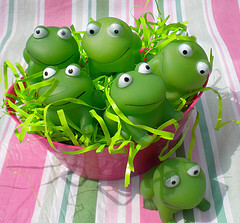 I found these cute frog squirters at Easter. They could be used for table decorations, party games or party favors. We did lots of pink for the girls and green for the boys. Each guest got a foam frog or Foam Butterfly Visors when they first arrived. The foam visors are sturdy and can get wet so the kids can wear them in the pool if they want to. The frog foam visors are harder to find. I happened to see them at Hobby Lobby last year and was able to get a couple of them. Every one of our pool parties starts with a parade before the kids get into the pool. 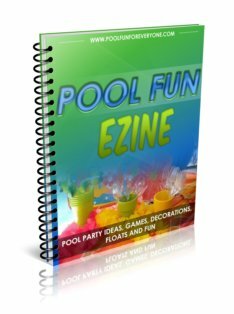 Pool party games are so much easier to plan when the party has a theme. 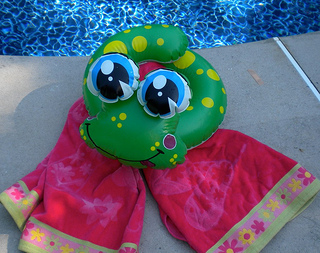 Frog floats and butterfly dive rings bring a special sense of fun to the swimming pool games. Divide the kids into two teams. Give each team a frog swim ring. One person from each team races the width or length of the pool and then hands off the swim ring to the next team member. The team that finishes first wins. Amazon carries a great frog swim ring for less than $5. Every pool party uses these fun dive eggs. What's inside is that makes the pool party game fun. 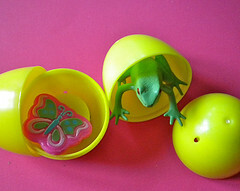 For this kids pool party theme, plastic butterflies and frogs were put into the eggs. Throw the eggs at a depth that matches the swimmer's abilities. One at a time, the swimmer goes to the bottom of the pool to get one egg. What ever is inside the egg they get to take home. 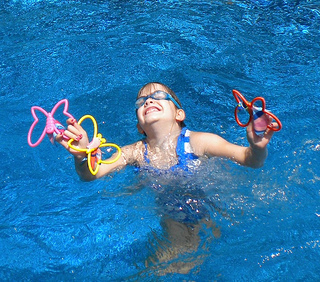 Our 7 year old granddaughter was excited about diving for the Butterfly Dive Rings. The colorful fabric wings make them flutter as they sink to the bottom of the pool. This is no ordinary ball. It is a Frog Hopper that bounces or skims across the surface of the pool. The trick is to throw the frog hopper side armed and low - close to the water. Like skipping a rock. 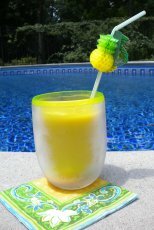 Looking for kids pool party ideas? 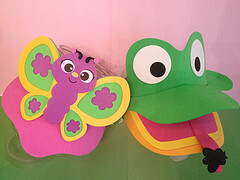 Bullfrogs and Butterflies makes a great kids pool party theme and gives lots of direction and creativity to your pool party decorations, games and party bags. 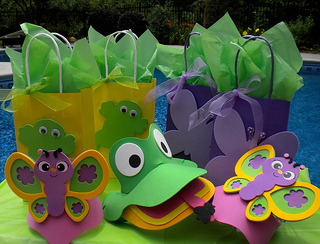 Solid color bags with simple frog and butterfly cutouts made of foam "paper" decorated the party bags. Add a ribbon and some colorful tissue paper so you can also use them for table decorations.